Ben Franklin, in his infinite wisdom, once suggested “Instead of cursing the darkness, light a candle.” Chicago veteran punk rockers Rise Against brought their Mourning in Amerika tour to Philadelphia on Saturday night determined to spread Franklin’s sage advice. 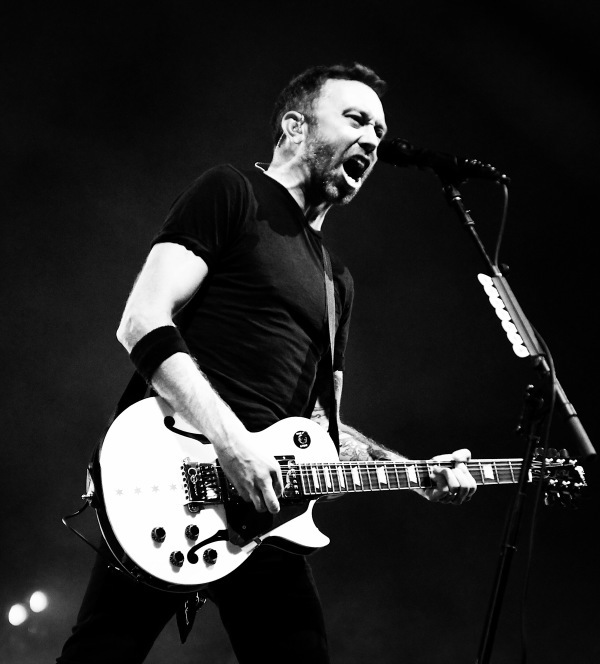 On tour in support of their new and altogether excellent Wolves album, Rise Against are now in their 19th year of melding Thin Lizzy guitar heroics to Bruce Springsteen-ian heartland earnestness. Saturday night at the Festival Pier, the band performed in front of a gigantic tarp with an vertical blood red and off-white striped flag bookended by silhouettes of a desperate looking man who appears to be about to jump to uncertainty or possibly certain death. Singer Tim McIlrath anchored the middle of the stage clad in all black a la Johnny Cash, slashing out riffs on his bright white Gibson guitar while lead guitarist Zach Blair and tattooed bassist Joe Principe bounded right to left behind him. Only the tippy top of drummer Brandon Barnes head was visible behind his drum kit but he was easily heard keeping time with great vengeance and furious anger at the back of the stage. Throughout their set, the band was strafed by white laser beams of light and stuttering strobe lights. Aside from the lighting and occasional acrobatic kung-fu kicks by Blair, the band eschewed theater and let their passion do the talking on a winding nineteen song journey through their history. Powerful and pulse pounding renditions of recent songs like “The Violence” and “House on Fire” easily held their own against memorable renditions of band classics such as “Savior” and “Ready To Fall,” but the emotional climax of the night came late in the show when the band performed “Hero of War” during a short acoustic set. This song might be the best song Springsteen never wrote and it would have fit comfortably on his revered album Nebraska. The song is a sparse and brief but painful meditation on soldiers and the horrors of war. Live, the song was a powerful missile that split the crowd in two, sparking a spirited sing along from half the crowd while the other half of the crowd seemed on the verge of tears. This entry was posted on Monday, August 6th, 2018	at 4:15 pm	and is filed under News	. Responses are currently closed, but you can trackback from your own site.